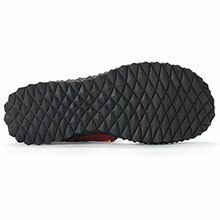 Possibly the most comfortable shoes you'll ever own! Colorful elastic straps cleverly woven together to create a stretchable Comfy Woven Mary Janes that not only looks great but moves comfortably with your foot. 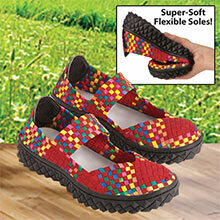 Thick, skid resistant, padded sole provides cushioning with every step for hours of easy standing or walking. Slip-on design with heel pull-strap. Imported. Available in whole sizes. Hurry! Quantities are limited! Great shoes. they do run small so get the next size up. Mine are too small but so cute I am wearing them anyway!